On Playback Menu 1, choose Erase Images. You see the main Erase Images screen. Choose Select and Erase Images. You see the current image in the monitor. At the top of the screen, a little check box appears. Tag the image for deletion. Tap the check box, press the Set button, or tap the Set icon to put a check mark in the box, thereby declaring it ready for the trash. If you change your mind, tap the box or the icon or press the Set button again to remove the check mark. Scroll to the next image. Keep repeating Steps 3 and 4 until you mark all images you want to trash. If you don’t need to inspect each image closely, you can display up to three thumbnails per screen. Just press the AE Lock button (or pinch the image) to shift into this display. Use the same methods to tag images for erasure and to scroll through photos as you do when viewing them one at a time. To return to full-frame view, press the AF Point Selection button. After tagging all the photos you want to delete, press the Erase button or tap the OK icon. You see a confirmation screen asking whether you really want to get rid of the selected images. Tap OK or highlight it and press Set. 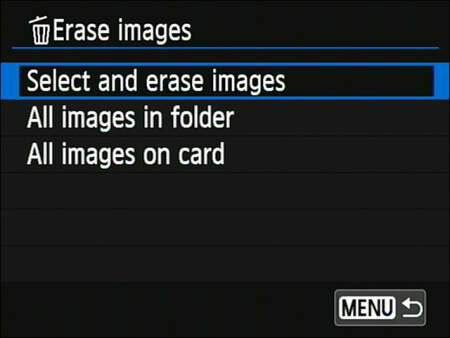 The selected images are deleted, and you return to the Erase Images menu. Tap the Menu icon or press the Menu button to return to Playback Menu 1. Or, to continue shooting, press the shutter button halfway and release it.